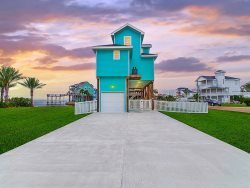 Lazy Dog Escape is a 3 bedroom, 3.5 bath beachfront Pointe West home, that sleeps 12, with unobstructed beach views & a pool table! Lazy Dog Escape features hardwood floors, brightly colored, cheerful and cozy furnishings. Relax in the family room, watching a movie or your favorite show on the large flat screen TV with over 200 channels to choose from. Prepare a delicious meal in the kitchen - complete with granite countertops, stainless steel appliances, and a separate beverage refrigerator for your convenience! The master bedroom has everything you could ask for - a king sized bed, fireplace, and flat screen TV. Enjoy the sunrise from the private balcony with lounge chairs, or a soak in the oversized tub with views of the water. The outside storage closet full of beach and pool toys complete the package. A large backyard, with outdoor shower and two picnic tables, is great for games or an afternoon picnic style lunch. Enjoy unimaginably easy beach access with the walkover in close proximity. Pointe West Beach Club features multiple pools, hot tubs, lazy river, cabanas, fitness center, bar, restaurant, gift shop, game room, etc. Book your stay and let the fun begin! Lazy Dog Escape is located in Pointe West. The Pointe West Beach Club offers numerous amenities; infinity pool, children’s pool, lazy river, fitness center, bar, restaurant, gift shop and game room. The Pointe West Beach Club (beachfront) and lazy river (bayside) can be located using the “Map” tab above. Pointe West Beach Club charges $10 per person (ages 3 and older) from March to September. The access fee is paid by credit card or cash directly to the beach club and is not included in rental rates. Use of the beach club is optional.